The Magic Statue is, as its name implies, a life-size stone statue with magical properties. Shaped like an Australian hunter, it bears the power to repel crocodiles. The Mushroom People who inhabit a small town in Down Under Land rely on the Magic Statue to keep their home safe from the neighboring crocodiles who would otherwise stop at nothing to eat them alive. Despite being made of stone, the Magic Statue appears to be rather light, as Kangaroo Koopa, Mario, Luigi and Princess Toadstool are all able to carry and toss it around with little effort. The Magic Statue has only appeared in The Super Mario Bros. Super Show! episode, "Crocodile Mario". During the episode, Kangaroo Koopa learns of the Magic Statue and travels to Down Under Land in order to steal it, leaving the town vulnerable to the crocodiles. Mario, Luigi, Princess Toadstool and Toad also travel to Down Under Land in hope that they can use the Magic Statue to protect the Mushroom Kingdom. However, they arrive just as Kangaroo Koopa swipes the statue and runs off with it. As crocodiles begin to invade the town, Mario and Luigi set off on a mission to retrieve the Magic Statue, as it is the only known means of ridding the town of the crocodiles, who are prepared to tear the place apart just so that they could eat everyone there. After a long journey, Mario and Luigi find the Magic Statue in a cave, with Kangaroo Koopa sleeping next to it. Although Mario manages to swipe it, Luigi trips and wakes up Kangaroo Koopa, who proceeds to chase them back towards the town. As they go, Mario and Luigi toss the Magic Statue back and forth, playing a game of "Koopa in the Middle" in the process. 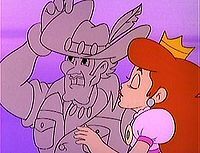 Upon returning to the town, Mario passes the Magic Statue to Princess Toadstool, who places it back on its pedestal and kisses it, causing it to blush and emit its power across the town. With the Magic Statue back in its rightful place, the crocodiles all flee town, chasing off Kangaroo Koopa in the process. This page was last edited on February 18, 2018, at 01:00.